As monthly local unemployment numbers were recently released by BLS, it’s time to visit that hot bed of minimum wage controversy, the city of Seattle. If you’re just tuning in, there’s been a steady chorus of voices – ongoing for some three years now – telling us (before the law even took effect) that a higher minimum wage would result in “reasonably large unemployment effects.” So, how are things going? 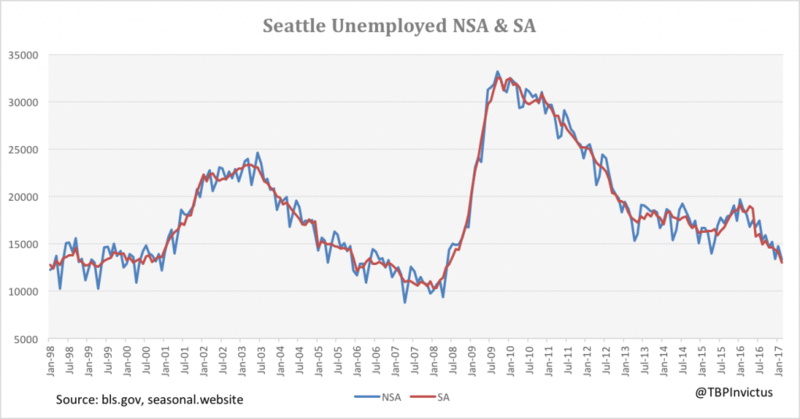 First up, below is Seattle’s Unemployment Rate. It is currently sitting at 2.9% (seasonally adjusted), which is a cycle low and near record low. Next, we take a look at the number of unemployed. It, too, is at a cycle low and approaching its record low. 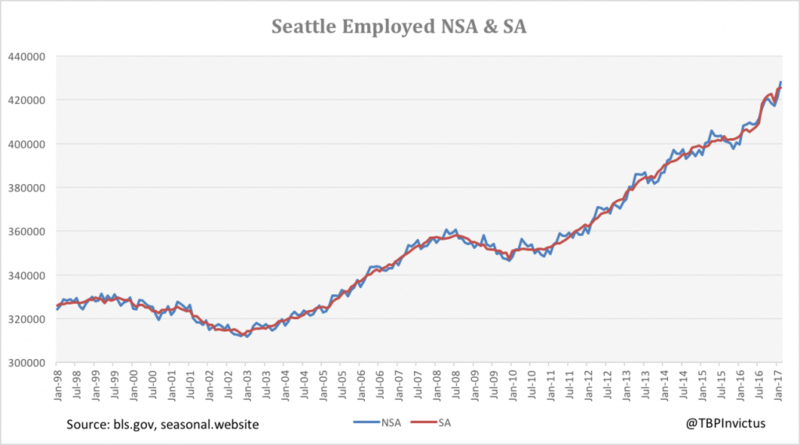 Here are the number of employed in the city – it’s at an all time high and seems to have been growing at an accelerated rate in the past year or so. Finally, here is a look at Seattle’s labor force. It, too, is now at an all-time high. 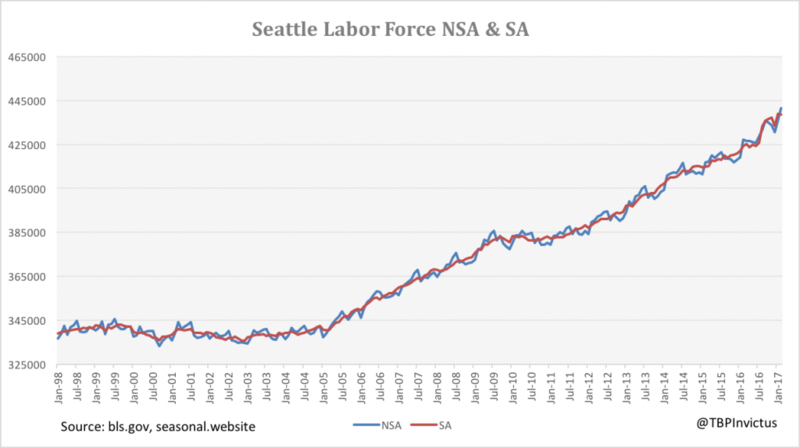 There is scant evidence to be had that Seattle’s higher minimum wage experiment has thus far been anything but a resounding success. Three years of arguing against it have proven futile although, sadly, the ideological naysayers are hard-wired to deny fact-based, data-driven evidence. 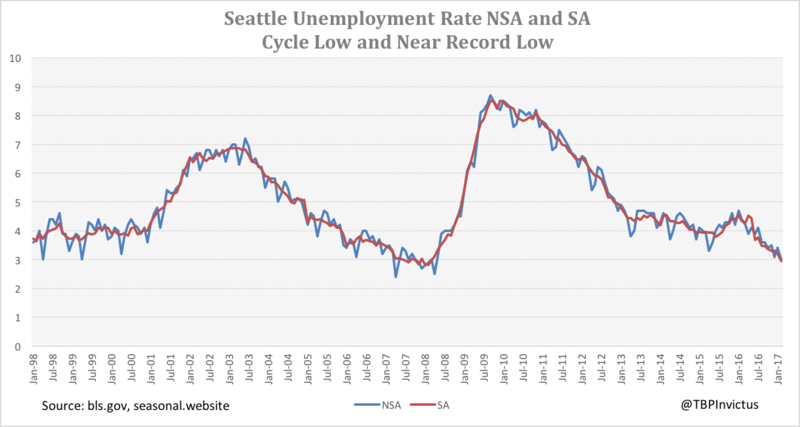 This economic cycle, in Seattle and the nation, will eventually run its course. That’s just the nature of cycles. But it bears repeating that the sky has not fallen in Seattle due to its higher minimum wage. The doomsayers have been proven wrong. Emphatically so. The city is thriving, a fact which is benefiting the entire region. The numbers speak for themselves. Labor is not like a widget, and we need to stop pretending that it is. Seattle should be a shining example for other municipalities. Time to raise the wage.